Life of Lou: Bacon, pea and goats cheese omelette. This weeks recipe is a breakfast classic and go-to in this house hold. It's also thanks to the crankiest cook in the world, Gordon Ramsey. But hey, we can't bag him because this recipe is undeniably good! Bring on lazy Sunday breakfast please. Preheat the grill to its highest setting. Melt the butter in a large non-stick frying pan and fry the bacon until golden brown and crisp. Toss in the peas and cook for another minute or two, then add the basil. Pour in the beaten eggs and gently shake the pan over a medium heat. As the omelette begins to set at the bottom, top with Goats cheese. Season generously with pepper and a little salt. Grate some Parmesan over the omelette and place the pan under the hot grill for a minute or two until the eggs are set on top. Slide onto a warm large plate. 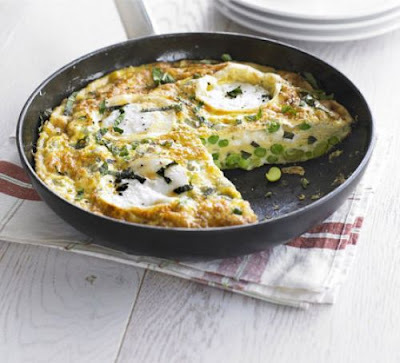 To serve, toss a handful of rocket leaves in vinaigrette to dress lightly, then pile on top of the omelette. Cut into wedges to serve.